When you take your next adventure in this Connect, you will find yourself wishing it would never end. 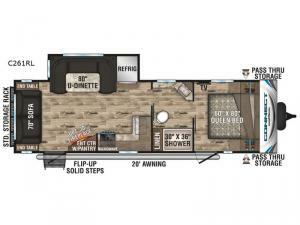 This travel trailer provides a spacious living area because of the single slide which houses a U-shaped dinette and refrigerator. You don't have to enjoy the beautiful outdoors alone because this unit has enough room to sleep six people when it comes time for bed, and the exterior pass-through storage will allow you to bring along all of your larger camping gear such as fishing poles, outdoor camp chairs and such. The inside LED TV and entertainment center offer indoor fun away from any bad weather days, and the 12-volt dual USB port will keep everyone's devices charged and ready. The master bedroom allows you to sleep on a comfortable queen bed with overhead lights to enjoy reading a book, and there is plenty of storage including underneath the bed. Take a look today!